What word best describes your bathroom? If it’s somewhere in the vicinity of “small”, “tiny”, or “minuscule”, then you may feel very limited in your renovation options. 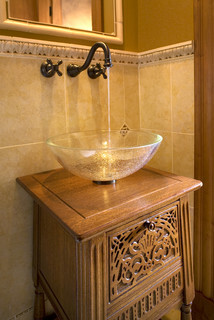 In fact, there are many ways to remodel your bathroom to make it feel bigger. Read on for 16 of our favorite tips. 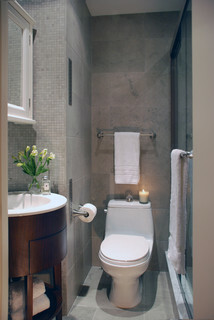 To make the most of your small bathroom, start from the outside in. 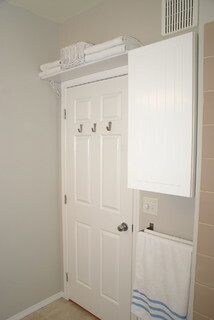 Rather than fret over allowing for your bathroom door to open, opt for a pocket door that recedes into the wall. 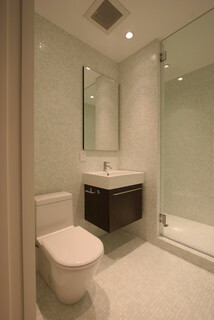 Open doors can eat up precious space inside your bathroom too. 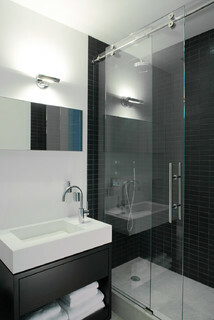 Select a shower curtain or sliding glass door instead of one that opens wide. 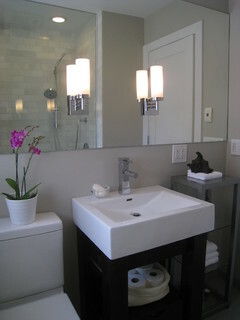 In a bathroom, like in any room, keep your color palette light and bright, in order to supersize your small space. Using a large mirror to fool the eye is the oldest trick in the book… and extremely effective at making your minute bathroom feel airy. 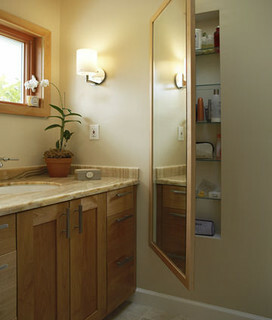 Let your mirror perform double duty, as a full-length medicine cabinet. In a tiny bathroom, look for charming ways to make use of space that is often overlooked, like the wall above the toilet. Install a shelf above a door to stow items to which you need less frequent access. Built-in units are a good way to elegantly pack heavy duty storage into a small area. Recessed shelving in the wall or shower offers the perfect opportunity for more space-efficient storage. Use U-shaped drawers under the sink to maximize usable storage around the pipe. Consider the space-efficient combination of a wall-mounted faucet and vessel sink, which leaves room to hold additional items, and frees up an extra drawer that a traditional sink would have monopolized. 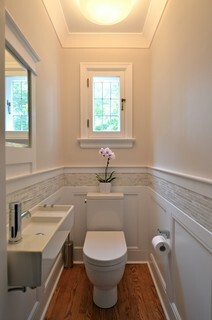 Traditional Powder Room by Design Cube Inc.
Opt for a trough sink, which steals less real estate from a small bathroom, leaving you more room to move. 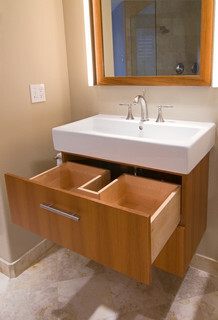 Save yourself from bumping into hard corners in a confined space, by choosing a round vanity. 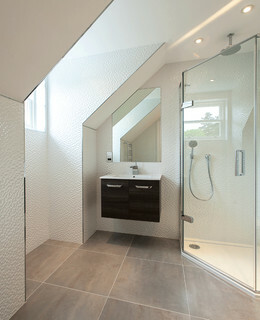 Make maximum use of your corners, which are all too often wasted space, with a stunning corner shower like this one. Corner vanities also make optimal use of small corners. Choose a wall-mounted model to make your small bathroom feel less confined. 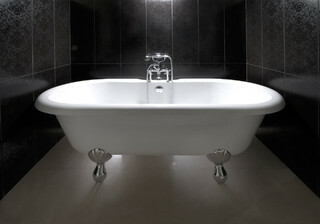 Finally, opt for a claw-foot tub, which lends an airier feel to a small bathroom than its more modern counterpart. Are you inspired to turn your diminutive bathroom into a thing of beauty? Call Keith Green Construction to get started on your bathroom remodel today!